Add bread cubes, toss until saturated, let sit for 10 minutes, toss again. Do this several times until EVOO is absorbed. Place on broiler pan rack in 250 degree oven for two hours. Turn oven off and leave in for four more hours. Store in airtight container. 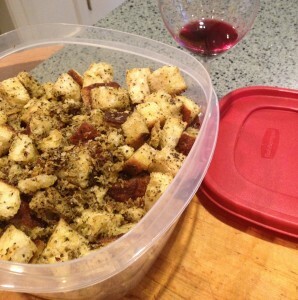 Can be used for croutons but best eaten like popcorn with wine.